Herbert Diess, VW's global brand chief, told reporters after the make meeting: "We're looking forward to really managing through the crisis and then really relaunching the brand and looking at a much more positive future." More Tiguans, Beetles and Golf SportWagen Alltracks are planned for U.S.
Volkswagen dealers show identification to enter their make meeting. LAS VEGAS -- It was supposed to be the week's best show in Vegas. A fireworks display. 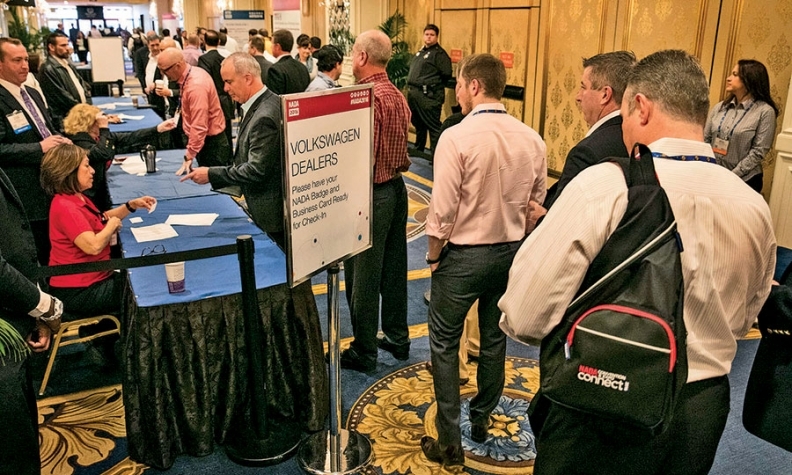 The long-awaited confrontation between beleaguered U.S. Volks- wagen dealers and besieged factory representatives at the brand's make meeting during the NADA convention. Volkswagen rolled out its big gun. Global VW brand chief Herbert Diess was in town, and when was the last time such a high-ranking visitor from Wolfsburg showed up for an NADA make meeting? Outside Ballrooms A and B at the Westgate Las Vegas Resort & Casino, a large knot of reporters and others waited anxiously for news from behind those big stateroom doors. After 90 minutes, VW dealers calmly filed out of their April 2 make meeting with promises of more cars to jump-start sales. But they had little new information about how VW planned to rectify the damage its emissions scandal has done to the brand and its retailers. Attendees said Diess and other executives offered no details about technical fixes for the diesel crisis or compensation for consumers, citing a government gag order. Neither did the executives discuss the prospect of settlement talks with dealers, who a day earlier formed a committee to lead negotiations with VW on compensation for losses incurred by retailers since the scandal erupted in September. "I would title the meeting "We're working on it,'" said Steve Kalafer, owner of the 17-franchise Flemington Car & Truck Country, which includes a VW store in Flemington, N.J.
"There were no promises other than broad statements that "We're working on it' and "We're doing our best,'" Kalafer said. "This is nothing more than more of the same." VW executives did say they would send more products this year in an attempt to help dealers through what is shaping up as a very tough 2016. VW brand sales fell 12.5 percent in the first quarter. Dealers will get an extra 20,000 Tiguan compact crossovers and 20,000 additional Beetle Classic compact cars this year compared with what was planned, said Matthew Welch, general manager of Auburn Volks- wagen near Seattle. Next year, VW will send 75,000 Golf SportWagen Alltracks to the U.S. after shipping 15,000 here for its fourth quarter launch, Welch said. Dealers said that the 2017 Alltrack commitment was double what VW had planned. Longer term, VW dealers need annual U.S. sales of around 500,000 by 2017 or 2018 to be the brand's new "baseline," Alan Brown, chairman of the brand's U.S. dealer council, told reporters after the make meeting. VW brand sales last year were just less than 350,000. "That's where [Volkswagen] AG is going to start to see wins; that's where the dealer network will really start to see a return on sales," said Brown, general manager of Lewisville Volkswagen near Dallas. Volume targets weren't discussed in the meeting, but Diess said in a statement to reporters that VW wanted to "grow the volume consistently above past levels" in the U.S.
"We're looking forward to really managing through the crisis and then really relaunching the brand and looking at a much more positive future," Diess told reporters. What he meant by "relaunching" is unclear. Michael DiFeo, dealer principal at Linden Volkswagen in Roselle, N.J., said any branding shifts should reinforce a message of "price-competitive German engineering." Meanwhile, the six dealers tapped to negotiate a settlement with VW hope to begin talks as "soon as possible," said Jason Kuhn, head of the Dealer Investment Committee, an offshoot of the dealer council, and chairman of Kuhn Automotive Group in Tampa, Fla. The group was formed to seek compensation for losses incurred by dealers and reduce the risk that breakaway dealers will sue VW. On Wednesday, April 6, Napleton Automotive Group broke rank with dealer council leaders and sued VW on behalf of its three VW dealerships. The suit, which seeks class action status, alleges VW defrauded dealers by rigging diesel vehicles and also claims VW violated various state and federal laws designed to protect dealers.